Phew, that was emotional for a post about salad!! Hahaha but totally worth it since this salad will BLOW YOUR MIND!! I started making this salad at RylieCakes a few years ago, wanting to get a few more vegan items on the menu. It is totally inspired by Oh She Glows blog - I just changed a few things up to make it my own but to also make it easier to keep out in the shop for a day or two. For example, the original recipe is topped with avocado - though this is absolutely fantastic, it wasn’t practical all the time at the bakery. However, I have done it a million times over at home and highly recommend it. Green Tabasco adds a fantastic kick to this salad. Warm it up, toss on the tabasco, and call it a night! Add fried eggs on top with a dash of furikake and call it breakfast. Why not?! Sauté with chicken for an extra dose of protein. Top with crispy bacon for a salty touch and an extra crunch. Sauté with mushrooms and onions for an added serving of veggies. Pair with grilled peaches (topped with balsamic) in summer for some sweetness. Add a cup of this salad to a bowl of hot broth and call it soup! Pair with pulled pork and green salsa and roll up into a burrito!! Seriously, do this one!! Pair with grilled salmon or cod. I find quinoa to be the perfect compliment to fish. Add peas, carrots, onion, fried eggs, and some soy sauce, fry it all up, and have an amazingly delicious take on Fried Rice. I hope you all love and appreciate this recipe as much as I have over the years. And don’t forget, its wildly tasty hot or cold so it makes for the perfect lunch, a snack on the go, or easy leftovers. Pre-heat oven to 400F and line a half sheet pan with a silpat. 1. Place diced potatoes, green beans, garlic, rosemary, and avocado oil into a medium bowl. Stir until all veggies are well coated. Transfer mixture to prepared sheet pan, spread out evenly, and bake for approximately 40 minutes, rotating pan and stirring veggies halfway through. Bake until potatoes are tender and a fork easily pierces through them. 2. Place water and veggie bouillon in a small saucepan and bring to a boil. Add quinoa, turn heat to low, and let simmer for 15 minutes or until quinoa is fully cooked. 3. While the veggies are baking and quinoa is cooking, toast pepitas with avocado oil in small sauté pan over medium heat. Pepitas will become slightly fragrant and golden brown when done. 4. Whisk together all the ingredients for the dressing in a large mixing bowl. I like to use the bowl I am going to serve in to eliminate a few dirty dishes here. 5. 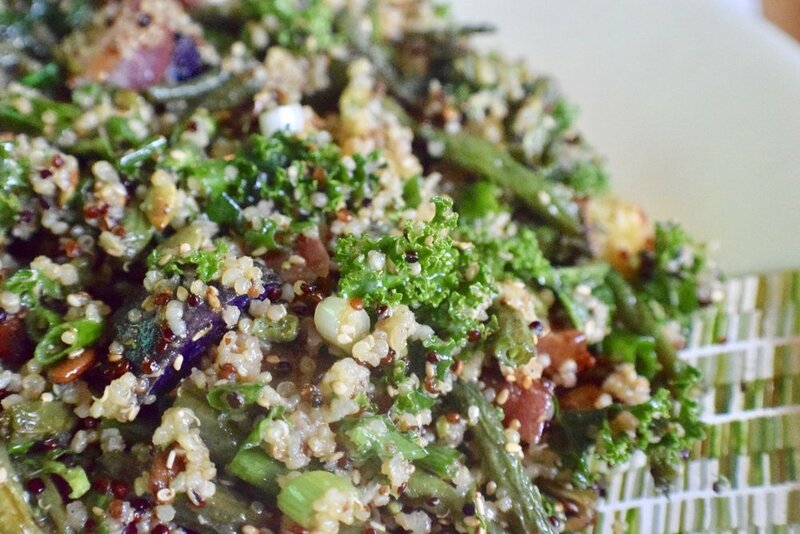 Add roasted veggies, cooked quinoa, toasted pepitas, kale, scallions, and sesame seeds to bowl with dressing. Fold together until combined. 6. Serve salad warm or cold. It is seriously fantastic both ways!